How do you decide what windows are right for you? Triple M Housing offers both traditional slider and Casement/Awning window options for your new home. At Sunridge Homes, we prefer our homes be built with Casement and Awning windows….. Here’s why! There are many advantages to Casement/Awning windows, including energy efficiency, ease of use, improved security & weather protection and better ventilation. Energy efficiency: when comparing casement and awning windows to conventional slider windows, one of the biggest advantages is the energy efficiency! When you close a casement or awning window, they lock into place, ensuring that they are sealed all the way around the window. This improves heating and cooling costs, saving you money! Casement and awning window seals are also less susceptible to wear and tear due to the way that they open and close vs slider windows which the seal is rubbed back and forth every time you open or close the window. Bethel’s casement and awning windows also have a 3 point weather seal system, which puts a stop to air and water leakage, sliders only have a 2 point seal system. Ease of use: awning and casement windows operate smoothly and easily with one hand. This is especially important for those with strength and mobility issues in the hand, wrist, and fingers. They can also be operated easily with one hand, which is convenient for those hard to reach windows like your window placed over your kitchen sink, or simply if you have your hands full! 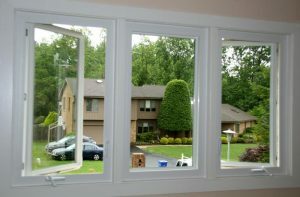 They also have a multipoint lock, making the opening of large windows much easier than sliders. Improved security & weather protection: both awning and casement windows lock when closed. However, awning and casement windows are installed from the inside, it is not possible to remove the glass from the outside, slider windows have an installation gap at the top which allows them to be lifted up and out. Awning and casement windows have a second lock combined with a mechanism for opening and closing the window which generally make them more secure. The tight seal of awning and casement windows also gives you the peace of mind that even in the heaviest of rain storms, the interior of your home will be protected from the outside elements. Better ventilation: because awning and casement windows open to the outside, this allows the window to catch the breeze and as a result provides much better ventilation. Awning windows also open from the bottom, allowing you to open your windows even when it’s raining. All Triple M Homes come with Bethel windows which are made right here in Canada! For more information on Bethel Windows, visit www.bethelwindows.ca.